Ardmore, TN (August 24, 2010) — Audio Enhancers, the award-winning leader in the automotive speaker cabinet industry, announced today the introduction of a line of audio speaker enclosures to add to their already extensive array of vehicle- and driver-specific models—the new KO Series, expertly crafted to deliver superior sound. Introductory pricing on the new KO models is being offered through August 31st, 2010. 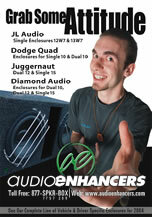 As with all of Audio Enhancers’ products, the KO series is 100% American made and includes a 100% money-back guarantee. The dual 12″ KO enclosure pictured is an exposed view to show internal construction and bracing. The finished enclosures are shipped covered in grey trunk liner or with an extreme bedliner coating. The KO series features 4 models – a single 10, a single 12, a dual 10 and a dual 12. MSRP on the single 10 is $114.95. 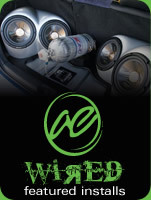 For decades, Audio Enhancers has been using the latest technology to supply automotive speaker enclosures to more than 900 dealers and distributors throughout the world, reflecting more than 28 years of evolution in the automotive speaker cabinet industry. Based in Ardmore, Tennessee, Audio Enhancers has grown from a small backyard operation begun in Lake Charles, Louisiana into an internationally known company and the technological leader in the industry. 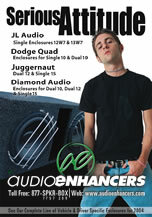 Audio Enhancers is a member of the Mobile Electronics Competition Association (MECA). For more information or product specifications, please contact Audio Enhancers at 866.775.7269 (SPKR.BOX) or visit audioenhancers.com.